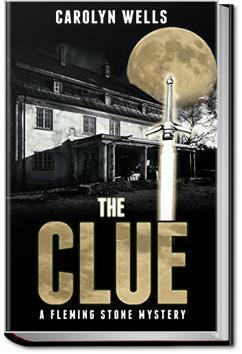 On the eve of her wedding day, Madeleine Van Norman, a beautiful young lady who is soon to come into her family fortune is found dead, apparently stabbed with an ominous blood-stained letter opener found nearby. There is nobody within the household who is not considered a suspect by the police, but how could a killer have slipped through the doors of Madeleine’s locked bedroom? It must have been suicide, as a note was found lying on a table near her body. Or was it? An intriguing mystery ensues which hinges on the discovery of a single, all-important clue. Miss Morton, also, seemed to have distracting thoughts. She sat down on the sofa beside Mrs. Markham, then she jumped up suddenly and started for the door, only to turn about and resume her seat on the sofa. Here she sat for a few moments apparently in deep thought. Then she rose, and slowly stalked from the room and went upstairs. After a few moments, Marie, the French maid, also rose and silently left the room. Having concluded it was a case for the county physician, Doctor Hills apparently considered that his personal responsibility was at an end, and he sat quietly awaiting the coming of his colleague. After a time, Miss Morton returned, and again took her seat on the sofa. She looked excited and a little flurried, but strove to appear calm. Book first published in 1909. Good mystery. Many suspects ... An it had me speculating throughout the book. Some of these old books are refreshing. If you like classic BW movies of the 30's and 40's, you'll like this book. Easy read - good for relaxing somewhere, not a lot of thought is needed. Enjoyable old school murder mystery. Agatha Christie-light, if there could be such a think. Very light. It's warmed-over Christie with a slight flavoring of Jane Austen. But even warmed-over Christie is still a pretty tasty dish.